In simplest terms, a Multi-Aspirator is a much more efficient way of separating or classifying materials (without any moving parts). By using the differences in terminal velocities of specific products, Multi-Aspirators use air to separate and classify materials by size, shape, and density. The entire system is based off the material’s size, density, and shape because those are the key factors that affect the material’s specific terminal velocity. How it works: A specific product will start falling at a slow rate and accelerate until it reaches its maximum speed or terminal velocity. If airflow within the aspirator is upward, it will oppose the gravitational force on the product, thus reducing the rate of the fall. If the air velocity reaches the products terminal velocity, the product will “float,” and if the air velocity exceeds the product’s terminal velocity, it will lift the product. The Multi-Aspirator efficiently and accurately removes the products with low terminal velocities from the products with higher terminal velocity. Why it’s used: To separate the products with a smaller size and shape and lighter density from the product with a larger size and shape and heavier density. For example, the Multi-Aspirator is used to remove fines from plastic pellets or to lift hulls from cut seed. Why it’s efficient: The zig-zag pattern forces the product to pass over the pick-up points over and over again nearly assuring that all the lighter material will be lifted away by the time the product makes it to the bottom. With Kice Multi-Aspirators, your materials flow more efficiently, which helps your business do the same. 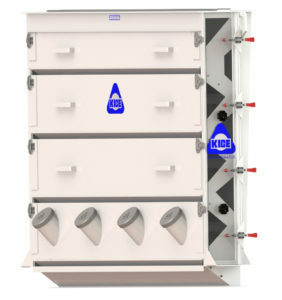 Using our proprietary technology, the product stream is exposed to air up to six times. 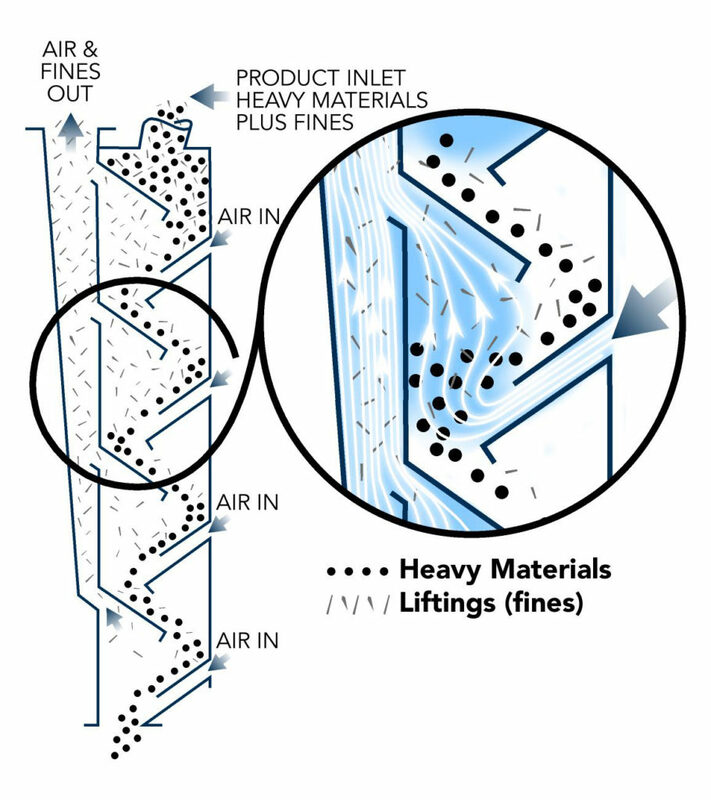 Each pass forces further separation of fines from the product. The result reaches a standard that our competitors simply cannot match. We design all our products for the specific needs of each customer. Then we build everything in-house. When you work with Kice, you get a partner and industrial equipment that you can rely on for the long haul. Kice has a lab available to test most products – returning samples for your inspection. Just a few of the types of products we have operating on Kice Multi-aspirators include grains, cereals, seeds, nuts, spices, baby foods, dehydrated vegetables/fruits, minerals, chemicals, fertilizers, plastics, wood/sawdust, pellets – virtually any free-flowing commodity that you would normally consider screening. We have even aspirated gold dust, chewing gum, and candy bars. Give us a chance to show you what it will do. Contact us to test out your product.